Many autistic people do not know what their rights and entitlements are. Additionally, unmet disability needs of autistic persons are a further barrier to accessing human rights, as unsupported persons may not have developed the skillset and coping mechanisms to obtain those rights without structured and planned support. For autistic women, disability intersects with gender. As more males than females are diagnosed with autism, the needs and experiences of autistic women are often overlooked. Furthermore, many autistic women have their diagnoses questioned or discarded, as autism is still perceived to be a primarily male condition. As a result, autistic women find it difficult to access to reasonable adjustments in traditionally female social roles (such as childcare), or in female-specific services (such as access to reproductive healthcare). These problems are further compounded for those autistic persons who also have a non-binary gender identity but a female body. Issues affecting autistic women are often excluded from the conversation within the autistic community. Just in trying to get the research on mothers completed, childless and single autistic males in charge of large autism lists made value judgements on what information women had access to. This potentially limited the number of participants. While progress has been made in recognizing the barriers to accessing diagnostic services for women, other issues, such as parenthood and access to reproductive healthcare and married life, go overlooked. The number of parents that are autistic is unknown. Autism is a neurological difference that is both genetic and hereditary with many autistic children having at least one autistic parent or other relative that is autistic. Against the enacted stigma by professionals some mothers may view it ‘unsafe’ to disclose their disability or to seek a clinical diagnosis. Those fears are not entirely without merit. Reports from peer advocates and groups reflect an over-involvement of autistic parents in child protection proceedings. Most have endured years of systemic injustice, misunderstandings by professionals and inadequate assessments. Due consideration to ensuring service provision aimed at supporting parent capabilities has been absent. Furthermore, due to the medical community’s delay in recognizing autistic women, many women that are autistic but have not been diagnosed, or are unaware of their autism, have entered into child protection proceedings without the accommodations they would otherwise be entitled to. Autistic women find they are presumed to be incompetent by the very professionals meant to assess and support their parenting without bias. Having a disability, being autistic, should never be accepted as the overriding reason to remove children, against their wishes, from their families; indeed, it would be a violation of human rights. Children have the right to be protected from all forms of abuse, neglect and violence. But children are also violated by unwarranted removal from their families without their consent. A 2015 fact-finding report by the Council of Europe Committee on Social Affairs, Health and Sustainable Development found that ‘England and Wales are really unique in Europe in placing so many children for adoption, in particular in the young age group which is “popular” on the adoption market’. Further, children are removed from their families as a precaution against ‘future emotional harm’ where no current or past abuse, neglect or violence has occurred, and frequently alongside allegations of Munchausen by Proxy (Fabricated Illness). Autistic family life is a natural component of society. No woman should need to consider systemic injustice and human rights violations as part of her future reproductive choices. No woman should have to hide her disability or have her disability unrecognised through failures of the systems meant to support her. The rights of autistic women can only be viewed as a crisis requiring immediate support by the international community. Proportionally, no other community of women is being violated through stigmatisation and discrimination, on such a grand scale, in the numbers that we represent. UN TALKS: Wagga-born Monique Blakemore with her son Nick, 11, presenting at the UN in Geneva about the challenges women and mothers with autism face. 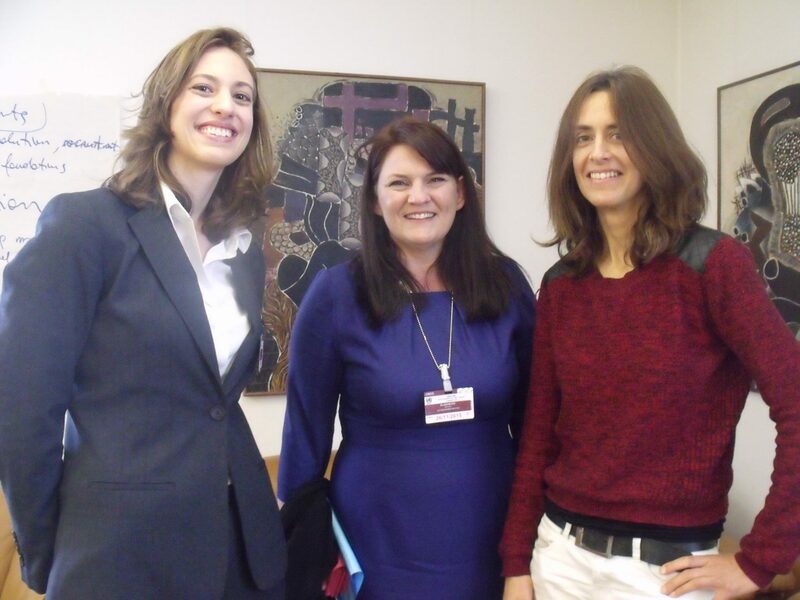 Monique Blakemore gave a briefing in Geneva outlining the discrimination of autistic women and stigmas surrounding autistic mothers.A Wagga-born woman has championed the rights of autistic mothers and women at an esteemed presentation to the UN. According to Ms Blakemore, autistic women and mothers are subject to disadvantage in most areas of their lives, including socially, in education and in accessing healthcare. As a mother of two autistic children the issue is close to Ms Blakemore's heart. "We really need to work at opening the conversation about what we can do to help all women struggling with autism, and particularly autistic women who are raising children," she said.